Not everybody is great on the telephone. In fact, many people avoid answering phone calls entirely, especially when the incoming call is from an unknown number. 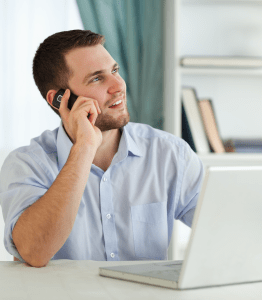 To guarantee a great first impression for your business you must ensure that the person answering the phone conducts themselves in a professional manner. To help you master the art, we share with you our most effective phone answering advice. 3. Keep your greeting snappy. If your company name is exceptionally long or if there’s a tagline you like to use, don’t use both. The purpose for answering is to hear why this caller is phoning your business and to determine how you can help them. Long greetings can sound clumsy and scripted and encroach on the space where your caller wants to speak. Be mindful of listening to the caller. 7. Answer within three rings. This is standard expectation in business and shows that you’re available and eager for more work. 8. Always have a backup plan. When you’re not able to answer within three rings it is important to have an alternative solution to answer your calls. Meetings, appointments, family time or even calls in the middle of the night require an effective solution to capture all your potential customers. Your voicemail should be professional! (i.e. not a recording of your favourite music track or even the standard mobile greeting that’s supplied as standard by your provider) Your callers need to know they’ve reached the right person or company and have confidence that their message has been received. Record a clear greeting yourself or ask ReceptionHQ to arrange a voicemail account for you. Even better, why not get yourself a virtual receptionist to answer the phone when you can’t? ReceptionHQ offer live receptionist cover 24×7 every day (and night!) of the year. If any of your business clients contact you via telephone, then enjoy it. These are the people who will keep you in business and tell their friends about you and there is no better marketing tool than happy customers!